Ensuring all kids get the opportunity to keep up with their mates in the classroom. 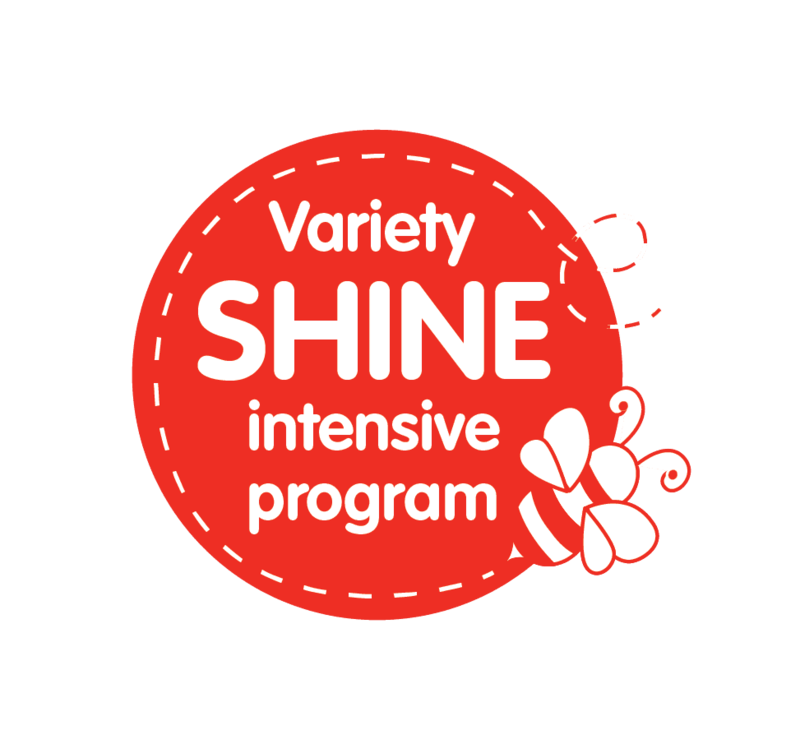 The Variety SHINE Intensive Program is an education program that ensures all kids get an opportunity to overcome language and learning problems and keep up with their mates in the classroom. Held in Port Melbourne under the directorship of Dr Carl Parsons, the program provides intensive opportunities for children with a range of disabilities to access high-quality multi-disciplinary team services at no cost. The multidisciplinary, evidence-based service provides intensive assessment, therapy and support for children aged 4-14 with language learning disabilities. We provide a safe, fun and stimulating environment with a range of school-type activities. These include art, music, singing, drama, dance and physical education. The unique program includes Occupational Therapists, Psychologists, Special Educators, Speech-Language Pathologists, Audiologists, Optometrists, Art/Dance/Drama/Music Professionals and Physical Education staff. The specialist team helps to develop programs around individual students’ interests and talents to provide a motivating, positive and creative learning environment. All programs run for 5 days, from 9am to 3pm and take place in Port Melbourne. Applications for the January 2019 SHINE Program are now closed. Please press the subscribe button below to receive updates about the January 2020 program. “First and foremost I would like to say how thankful, grateful, and lucky we feel for participating in the Variety Shine Intensive Program in Port Melbourne. This program that Variety supports, has been one of the most positive experiences Thomas has ever been a part of. We both felt so welcomed from the moment we walked in the door. The girls working with Thomas were terrific. Thomas came home every afternoon with a smile from ear to ear beaming about the fun things he did at school during the day. He has been asking all week if he can go to your school now as it was so fun. It was so nice for Thomas to remember that school can be filled with fun, laughter, and reward not constant challenges that he can not achieve. SHINE programs are intensive opportunities for children with a range of disabilities to access high-quality multidisciplinary team services at no cost to families. We prioritise students who are NOT funded by other federal or state programs, are under funded or under-resourced, or students who have known disabilities but have no services. NB: Services are not suitable for the following areas: Intellectual Disabled, Severely / Profoundly Autistic, Physically Impaired (Blind, Cerebral Palsy, Cerebral Palsy, Deaf, Stroke), Major Problem Behaviours, Major Medical Issues, or those with Major Mental Health concerns related to Trauma. Three professional clinicians involved with the program review all files for each applicant and determine if the program will be able to meet their needs. In some cases, professional advice is sought from other professionals. Completion of a formal application to the program and the week/s you would like to attend including details about what you believe needs to be worked on. Medical and Psychological reports that identify potential learning difficulties. Lists of medications the child is currently taking. Any assessments of hearing (auditory skills) and vision. Any and ALL assessments of Intellectual Ability or Intelligence Quotient. Any and all assessment reports identifying the child’s difficulties. Any and ALL previous therapy reports helping us understand what has been tried already. At least the two most recent school reports for the child or a letter from the child’s teacher outlining what the student needs help with. If the child has had an Individualised Learning Program (at school) then the most recent ILP should be provided—this also helps us determine school-based goals that have been agreed upon by the family. The family and school can provide any additional information that will aid us in determining eligibility and helping us target appropriate skills that need work. All these materials are utilised to determine eligibility and what goals we might target during the intensive program. We cannot make a decision about inclusion in the program until we are confident we understand your child’s needs and how we might assist. In some instances, we may recommend further assessments and may be able to organise these at no cost. SHINE or Variety Victoria staff may contact you to clarify information in your child’s application. The VSIP’s National Program Director, Dr Carl Parsons, is an eminent clinician and academic. He is the brains trust behind SHINE’s unique programs and the work of the Foundation over the last 20 years. He holds a Bachelor of Science (Speech Pathology & Audiology), a Masters of Science in Education and PhD in Communication Disorders and Psychology. Carl’s career has spanned many posts as a professor, clinician and consultant to universities, schools and specialist centres in Australia and the United States. He is widely published internationally and has contributed his expertise to innumerable curriculums, projects and policy development projects. These include the positions at LaTrobe University of Associate Professor in Child Language Disorders, Head of School of Human Communication Sciences, First Associate Dean of Research – Faculty of Health Sciences, Deputy Dean – Faculty of Health Sciences and Head of Department of Podiatry. As the National Program Coordinator for SHINE and the Andrew Dean Fildes Foundation he has built clinically effective, multidisciplinary programs informed by many decades of senior experience, the highest level of international research and technology. SHINE’s programs are robust, rigorous and evidence based, and over the last 20 years have immeasurably improved the lives of 22,000 children and their families. For further information please visit the VSIP 2018 SmartyGrants application form.